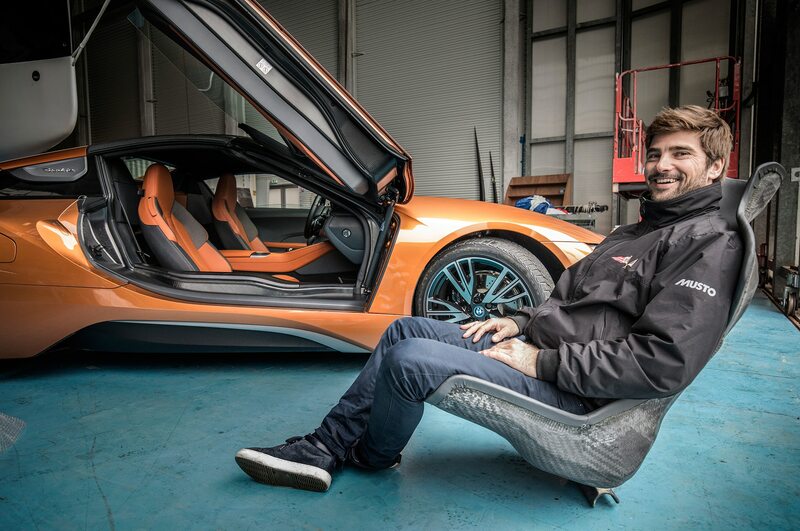 A hybrid that’s better than a pure EV or a pure dinosaur-juicer? Back in the wild and wacky 19th century, some scientists held a notion called recapitulation theory, which claimed embryonic development followed the branches of an organism’s ancient evolutionary tree, from, say, fish to lizard to dog to human. Its most famous and lasting impact is a curious, confusing phrase, coined by German naturalist Ernst Haeckel: “Ontogeny recapitulates phylogeny.” That theory has been discredited for more than 100 years, largely because it’s total hogwash. 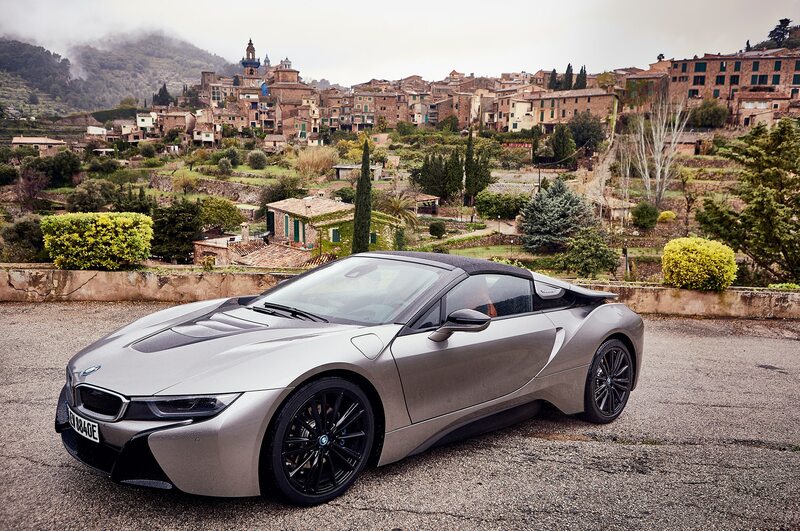 But if it hadn’t been epistemically eviscerated, the BMW i8 would gladly do the job, throwing biogenetic law out the window, clean-sheeting a sport-hybrid DNA that’s in its own image and none other. 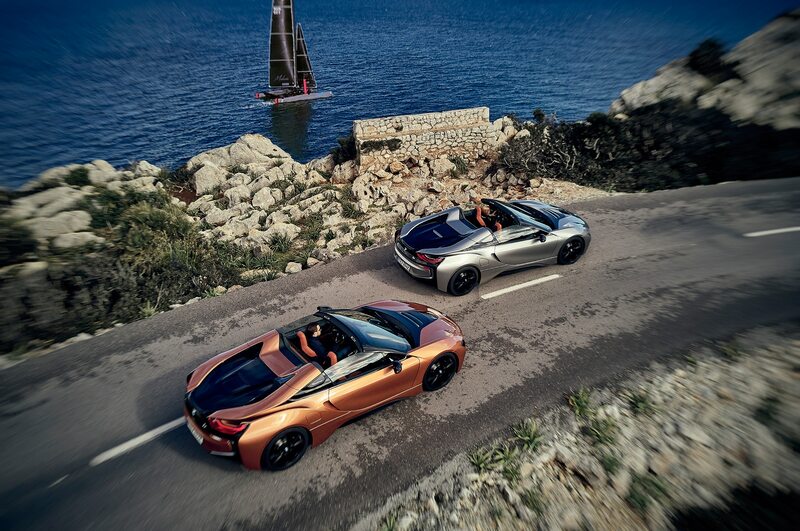 That image is pretty stunning, too, thanks to the concept-like futuristic design. 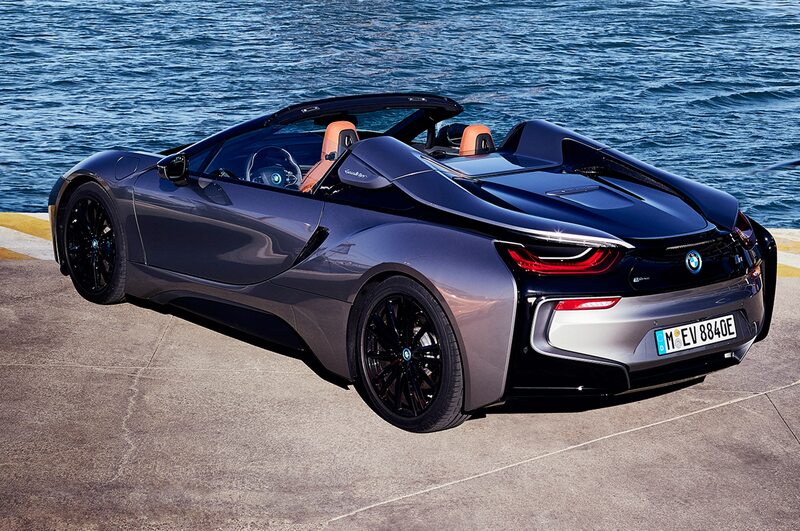 If there’s a bad angle to the i8, there’s only one: viewed from directly behind, at the driver’s eye level of another trailing i8 (or similarly low-slung sports car), the buttresses that are so beautiful when standing curbside sag into an M-shaped mess. It looks a bit like a tree fell on it. But that’s a problem for the gal behind you. 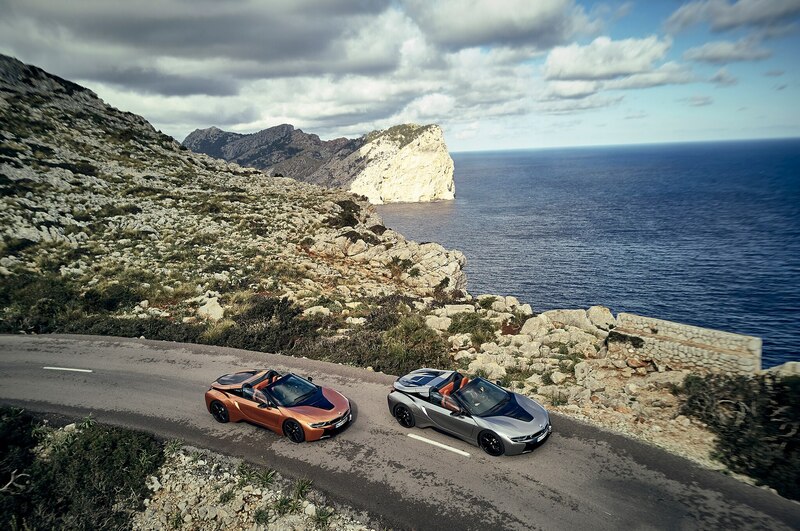 Fortunately, the i8 Roadster wears its curves just as well as the coupe, simply swapping the hard top for a cloth-topped mechanism that folds neatly away. 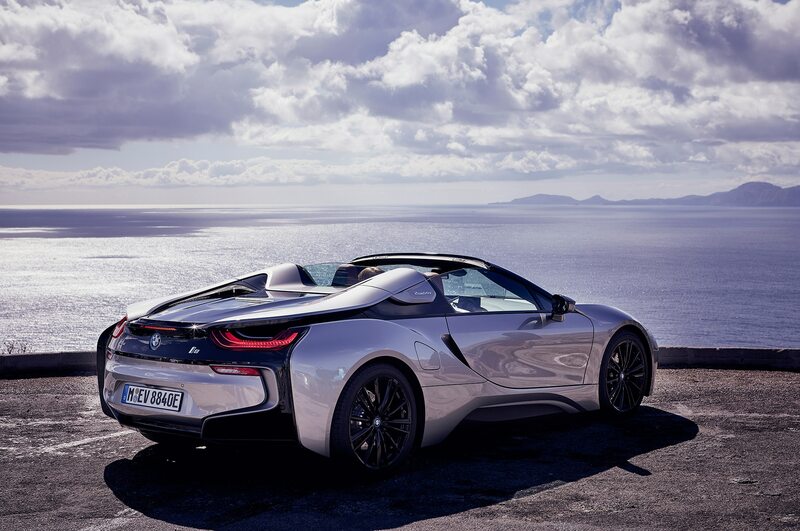 It’s been a long four years coming, but the i8 Roadster brings open-top cruising to the i8’s bag of tricks, which otherwise includes making a three-cylinder turbocharged 1.5-liter engine sound great (perhaps the greatest sorcery of all), and yet at the same time delivering an all-electric mode that brooks no gimmickry, great handling, and surprising driver engagement given the 28 mpg combined rating and 76 mpge rating when in electric-only mode–a level of efficiency typically reserved for numb, coddling commute-boxes. The i8 Roadster, as you might guess, is anything but numb, and while eminently comfortable even over extended periods in the seat, it’s hardly coddling. 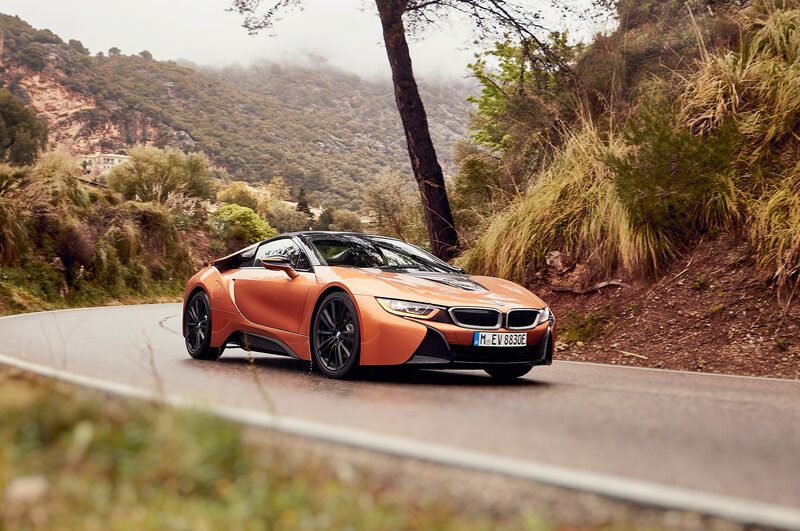 If anything, the i8’s immediacy of control, especially the brilliant steering, encourages focus and inspires fluidity, keeping the driver too engaged to be lulled into complacency. 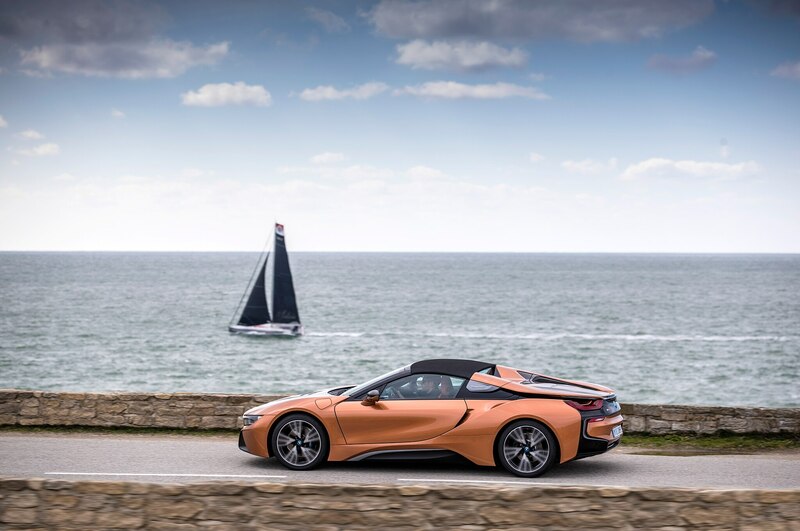 Likewise, the i8 Roadster’s suspension tune, fabulously rigid carbon chassis, and inherent balance—due in part to the unusual engine/motor combination and layout—rewarding good driving whatever the pace, but always hinting at the possibility of more. 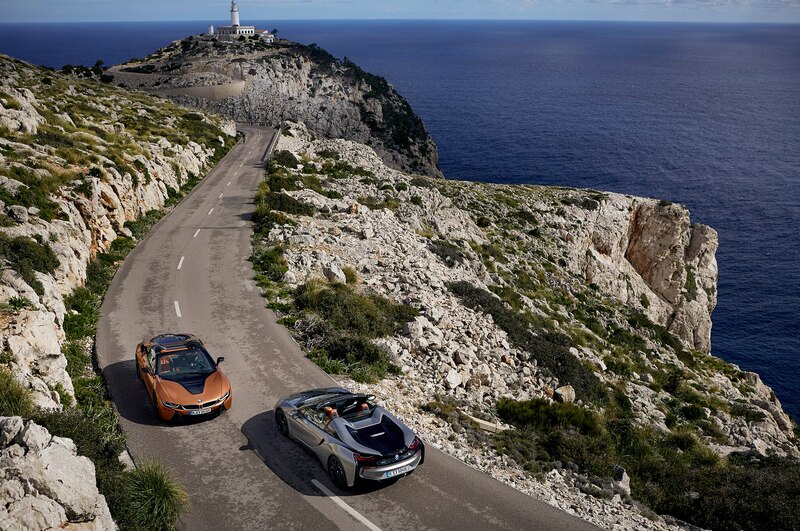 Best of all, with the new power-operated convertible top, the i8 Roadster lets you soak in the rays while basking in the brilliance of a car that’s neither mid-engined, front-engined, nor rear engined. A press of the button and 16 seconds later, you’re freed from the cage, wind in your hair but not aggressively so thanks to a small rear window (which can be operated independently of the top should you wish to get some air on a misty day) that also serves as a wind buffer. Best of all, the weight penalty for the Roadster is only 132 pounds over the Coupe, for a total claimed curb weight of 3,521 lbs. 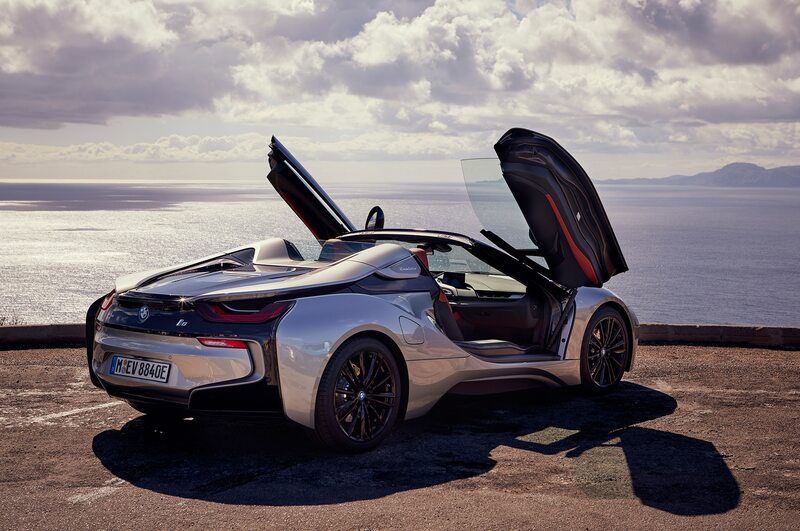 The i8’s unusual drive system is, apart from the futuristic, flying-buttress design, the main attraction of the car. 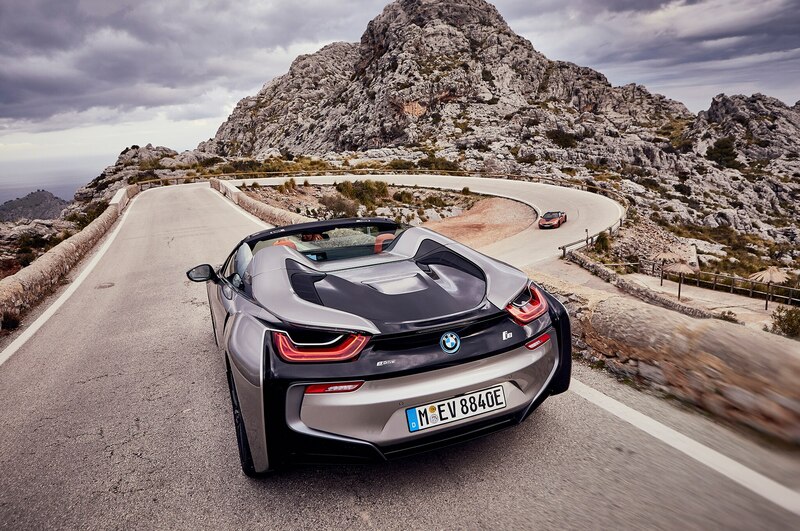 Known collectively as BMW eDrive, it’s a two-part system. 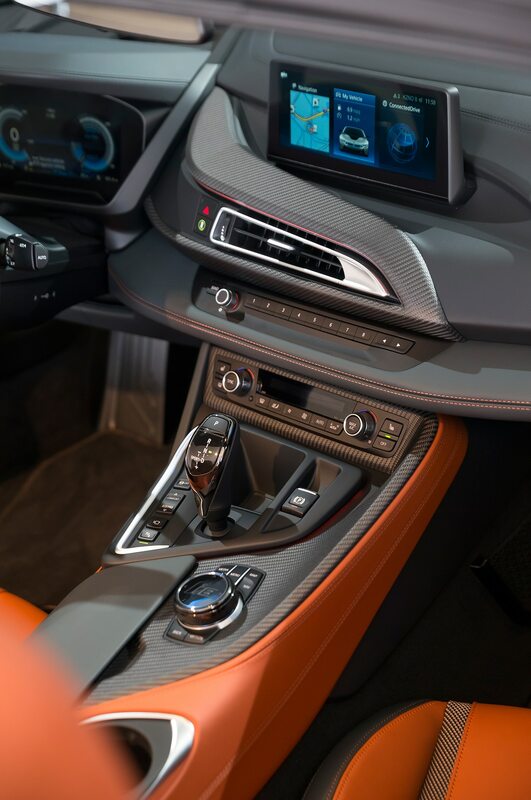 A single mid-mounted three-cylinder turbocharged 1.5-liter gasoline engine generates 228 hp and 236 lb-ft of torque, and drives the rear wheels through a six-speed automatic transmission. 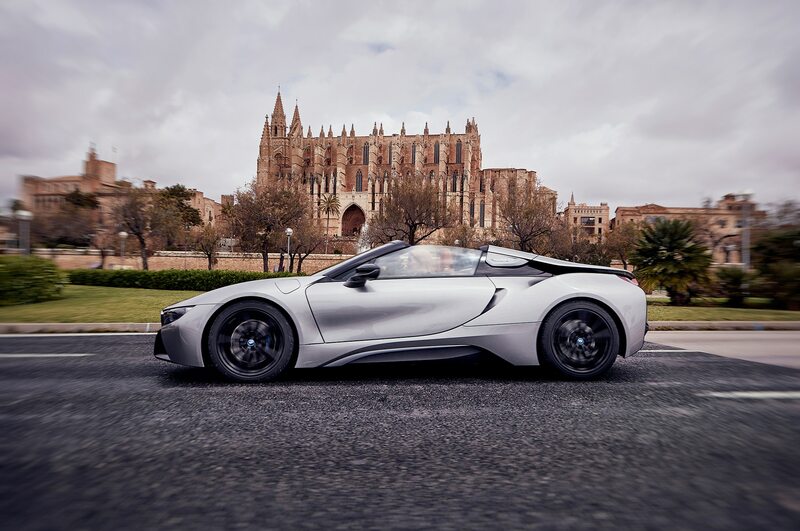 Up front, a single electric motor drives the front wheels through a two-speed automatic transmission, with peak power output of 143 hp and 184-lb-ft of torque. 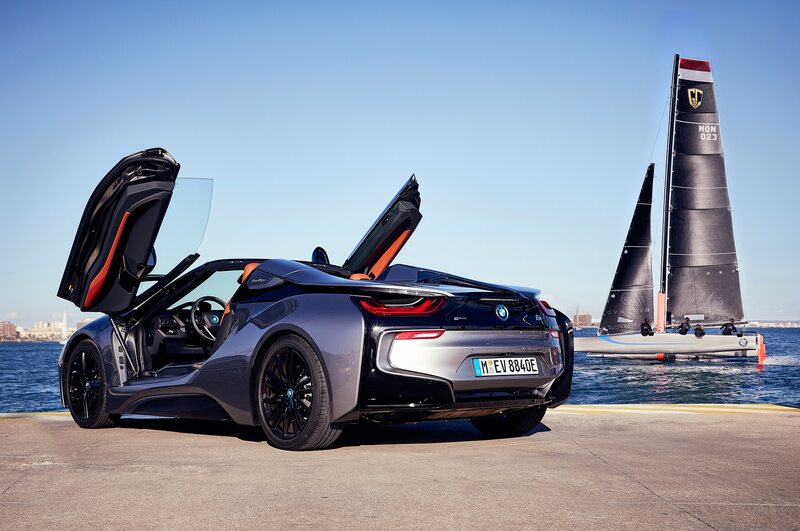 The power output of the electric motor is up 14 hp thanks to a more powerful, higher discharge-rate lithium-ion battery pack, now rated at 11.6 kWh, up from 7.1 kWh in the 2018 and earlier BMW i8 Coupe. 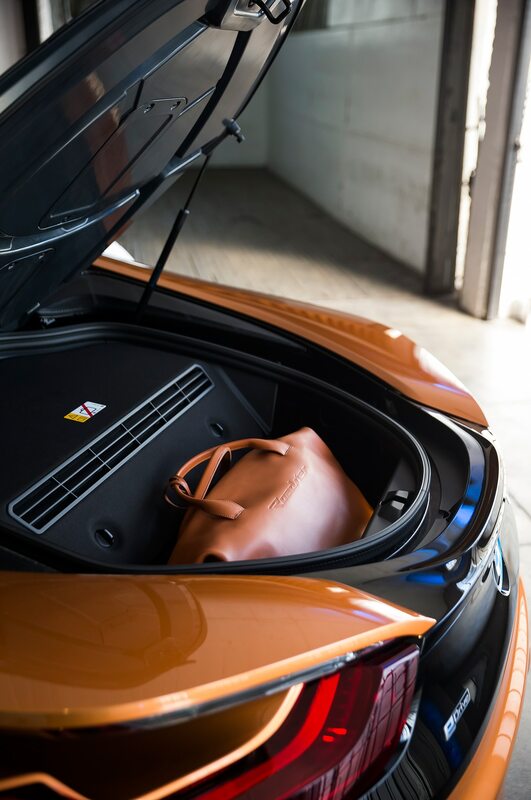 For the 2019 model year, the Coupe also gets the same power and battery upgrades as the Roadster. 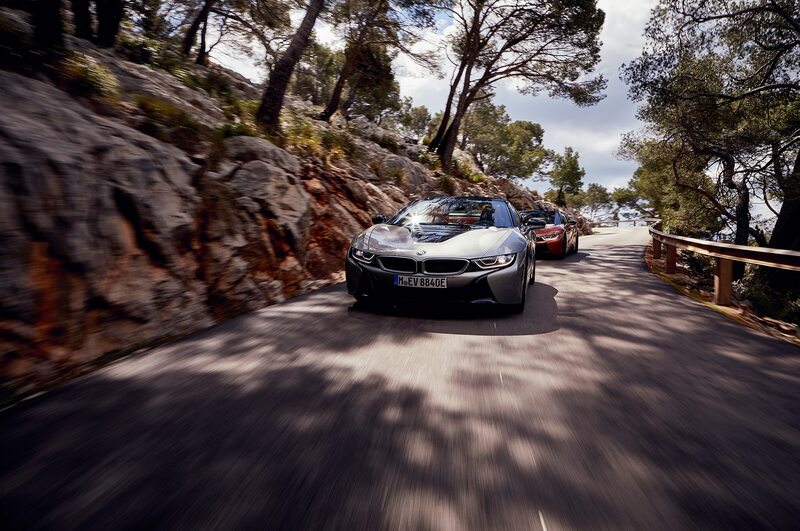 Total combined output: 369 hp. 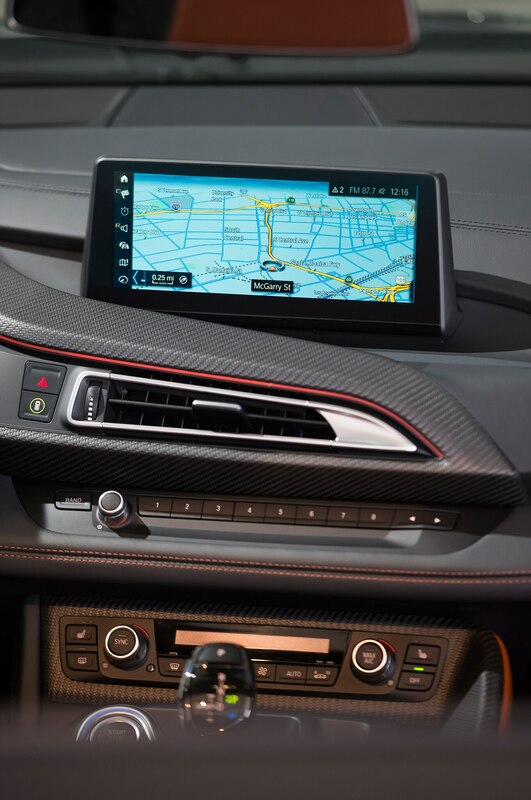 With so much going on in front of and behind the driver just to get the power to the wheels, you might think there’d be little left in terms of control–the computers must be doing everything. That might, in fact, be the case, but it certainly doesn’t feel like it. 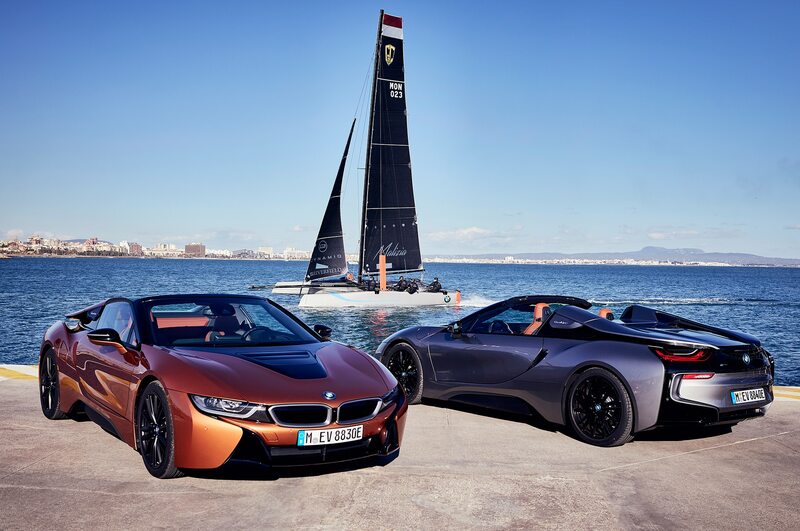 Whether in pure electric mode, normal hybrid mode, or sport mode, any movement of the throttle delivers a precise and predictable modulation of power. 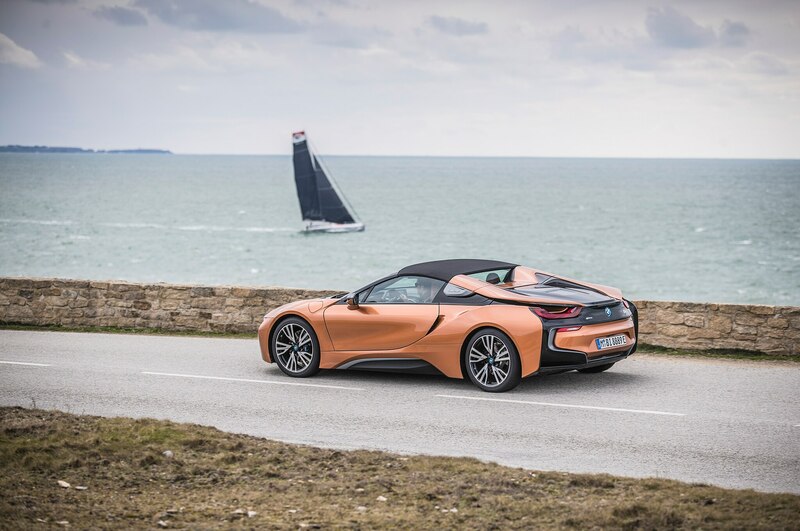 The brake pedal, which also engages the regeneration function of the electric power system, likewise feels surprisingly natural, without the steps or sudden, jerky changes in brake pressure sometimes felt with hybrids. 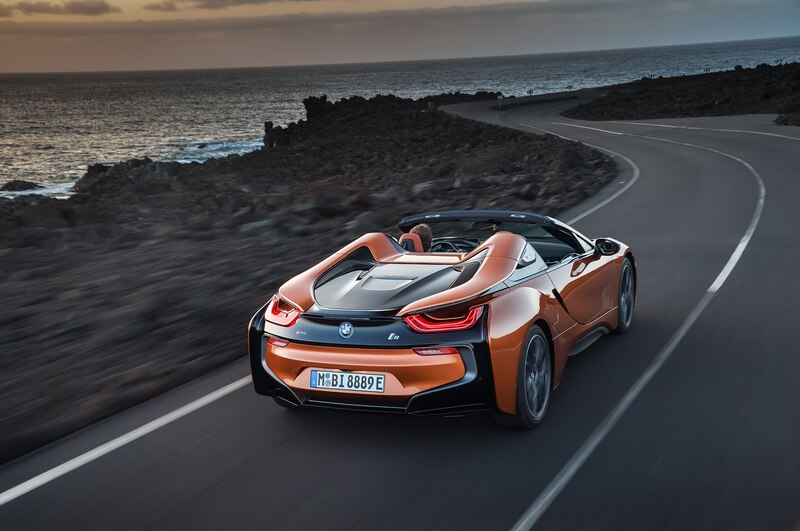 Sport mode, in particular, is an interesting one. When engaged, the three-cylinder gasoline engine runs all the time, rather than automatically shutting off when the vehicle comes to a stop. 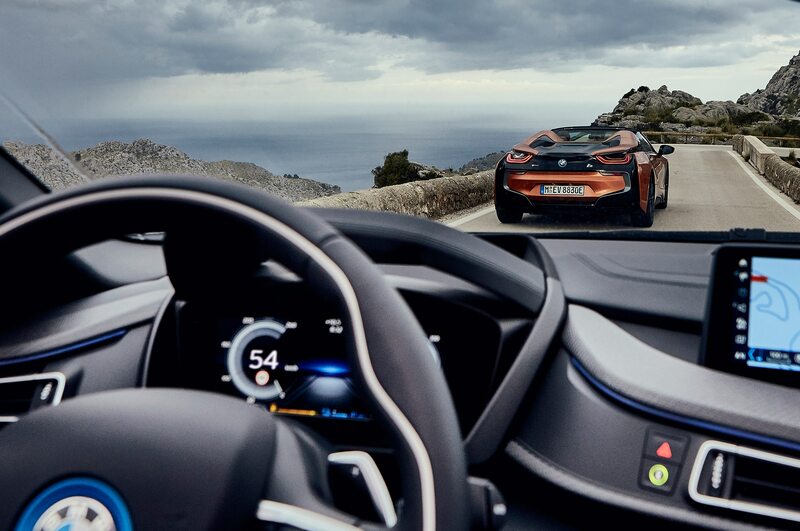 Part of the reason for that is increased responsiveness, as you’d want when driving enthusiastically; part of the reason is that, in sport mode, the engine tries to keep the battery topped up to a level that allows maximum performance of the electric drive system, extracting the greatest total performance from the car without the sad face of an empty battery popping up on your instrument panel display. 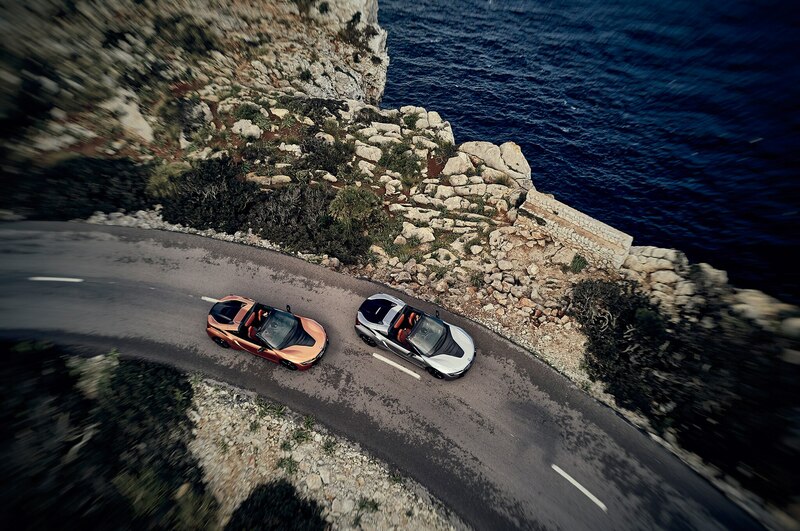 The fun lasts as long as your fuel does. 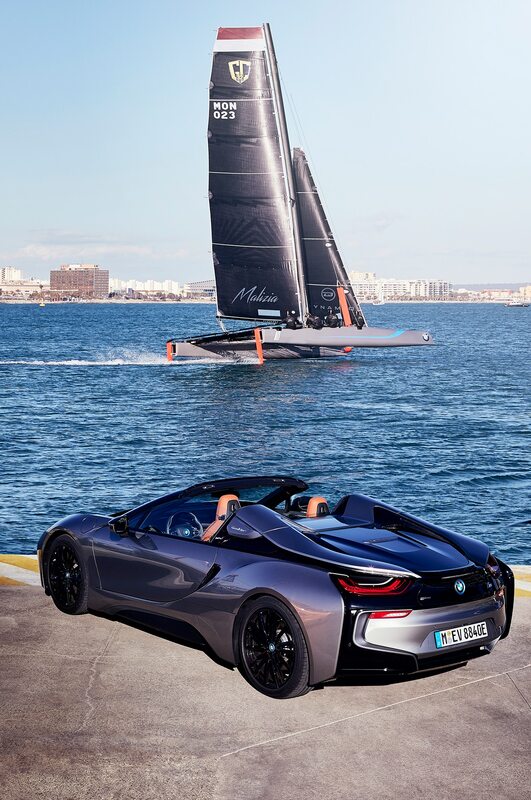 In standard hybrid mode, the engine doesn’t work so hard to keep the battery topped up, adopting instead a scavenging strategy that recaptures as much energy as possible when braking or coasting, but is otherwise geared toward maximum efficiency. 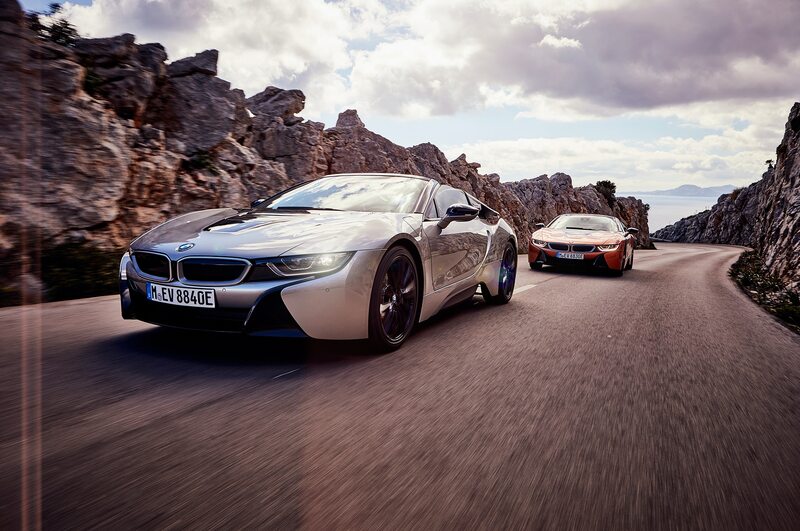 Should a stint of such driving leave your battery nearly depleted, but you wish to arrive at your destination on electric power alone (whether for quietness or for restricted access in a city center), all you need to do is switch into sport mode for a while and the battery will be topped up quickly–surprisingly quickly, in fact. 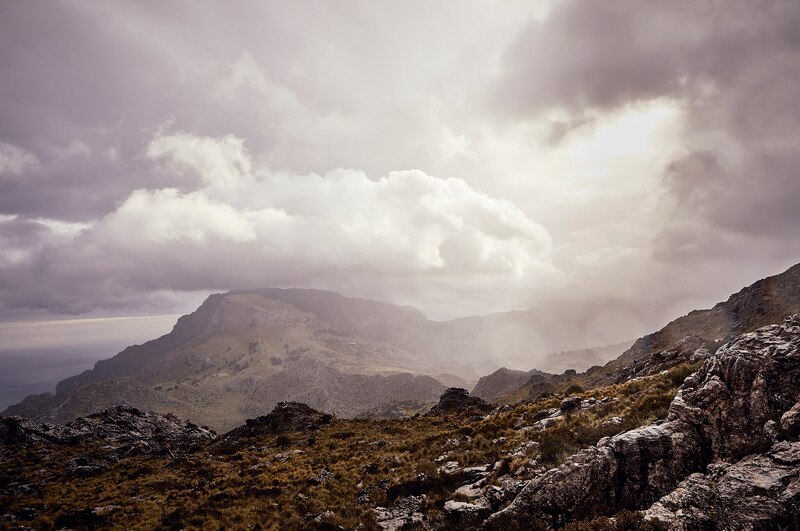 In my time dodging cyclists on Mallorca, it seemed to be able to take the battery pack from mostly depleted to completely full in about 15 minutes. 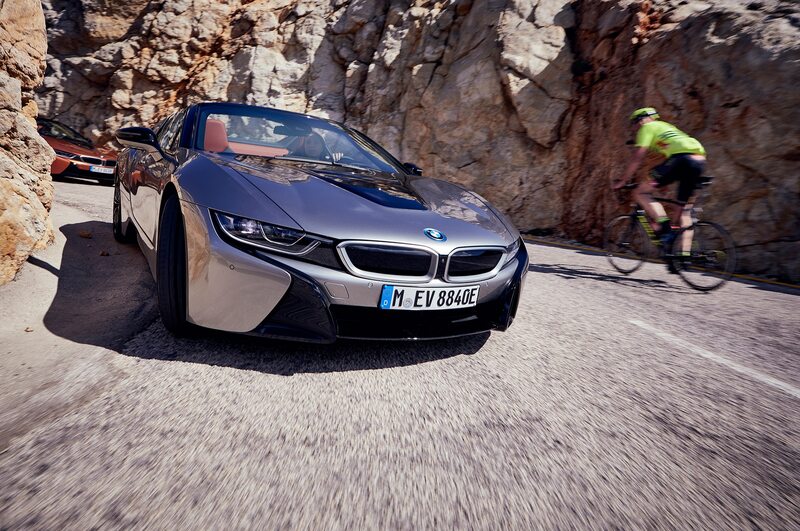 Plenty quick enough to grab some electrons near the end of your commute before going full-EV. 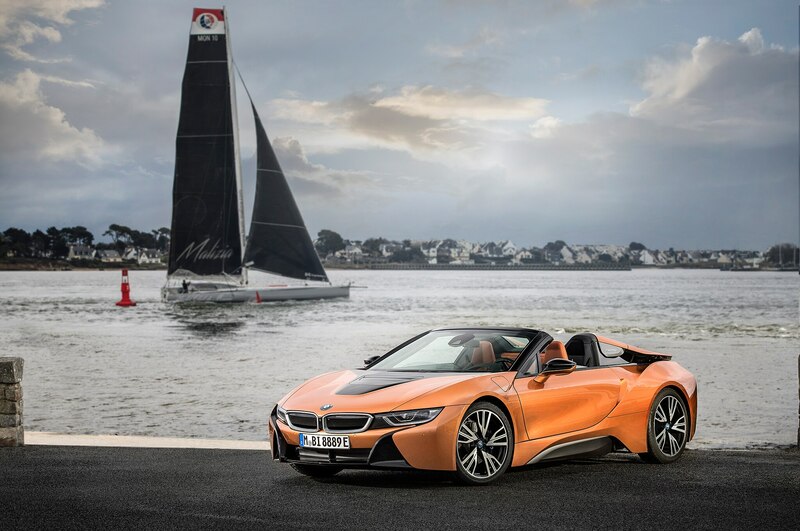 In full electric mode, the i8 is perceptibly less eager to run, which makes sense given the lower power output of the electric motor. Even so, it’s peppy enough to keep up with any city traffic, and, should the need arise, a firm boot of the throttle pedal to the kick-down point will engage the three-cylinder gas engine to provide on-demand acceleration–a tremendous safety feature when a quick squirt of acceleration might be the difference between a close call and a hospital visit. How far can you go on battery alone? 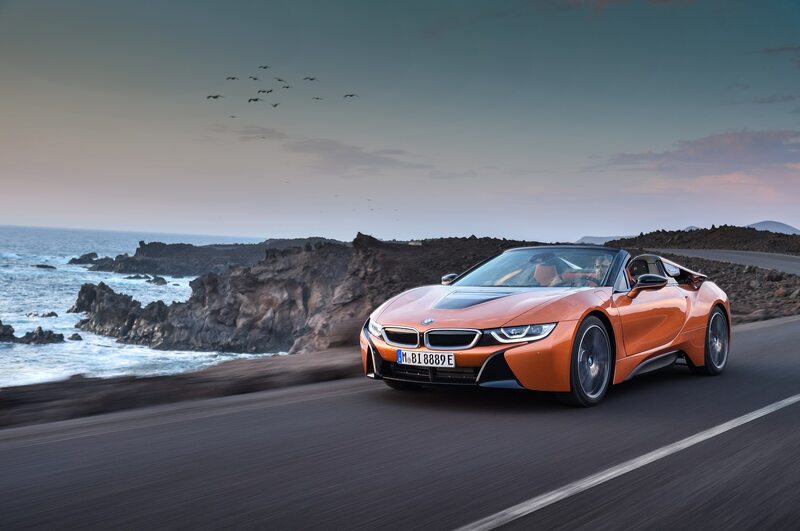 Up to 33 miles, according to BMW, which makes the i8 nearly as practical as a Chevy Volt or Toyota Prius Prime–while remaining infinitely more fun. 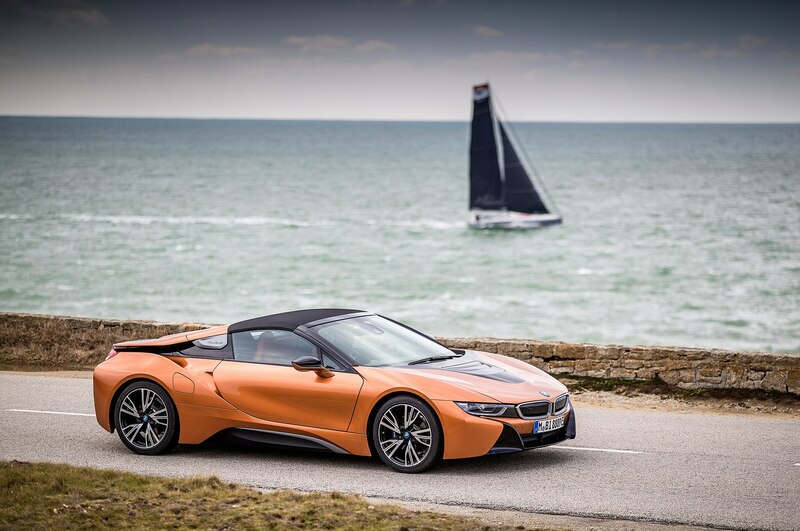 Of course, the perfect balance of hybrid and sports car can’t be cheap, right? 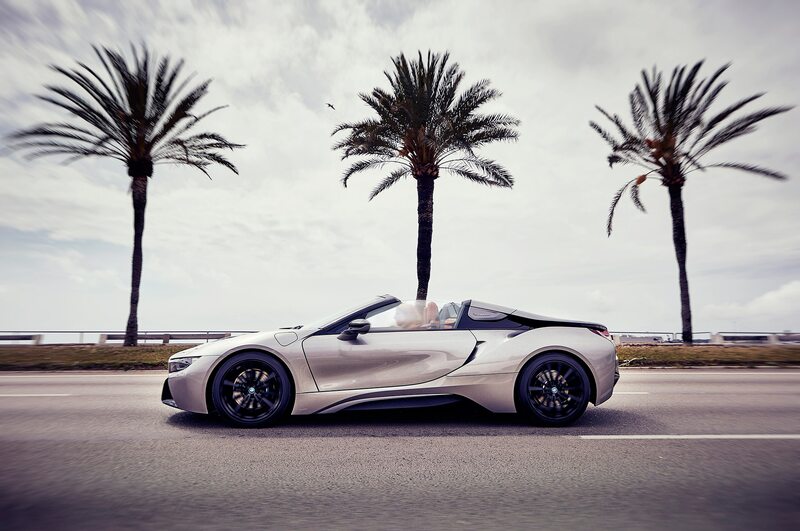 Unfortunately, no, it can’t be, and in the case of the i8 Roadster, it amounts to BMW’s most expensive base price: $164,295 including destination and delivery. That’s a $15,800 premium over the i8 Coupe, and while the difference is negligible dynamically, the impact on the experience of being able to let the top down makes a compelling case for the extra spend. 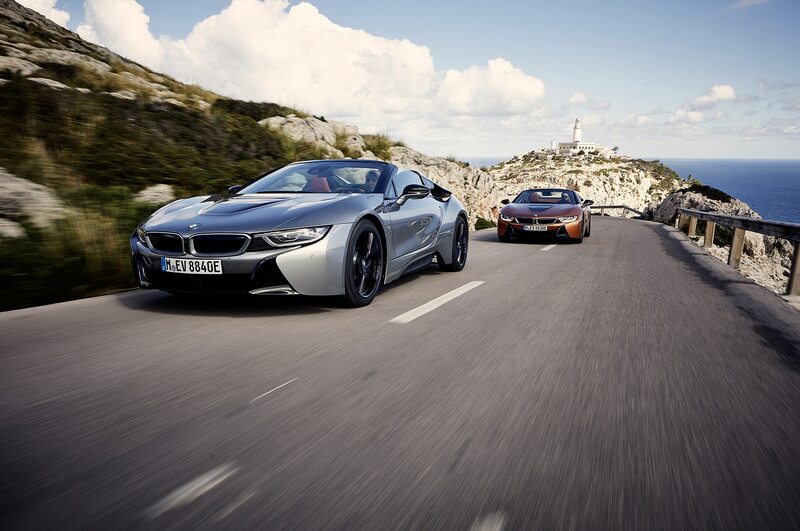 Whether you prefer the Coupe or the Roadster, however, is beside the point: the i8 is a hybrid like no other. While it shares some similar concepts, its application of those concepts is unique, and incredibly effective. 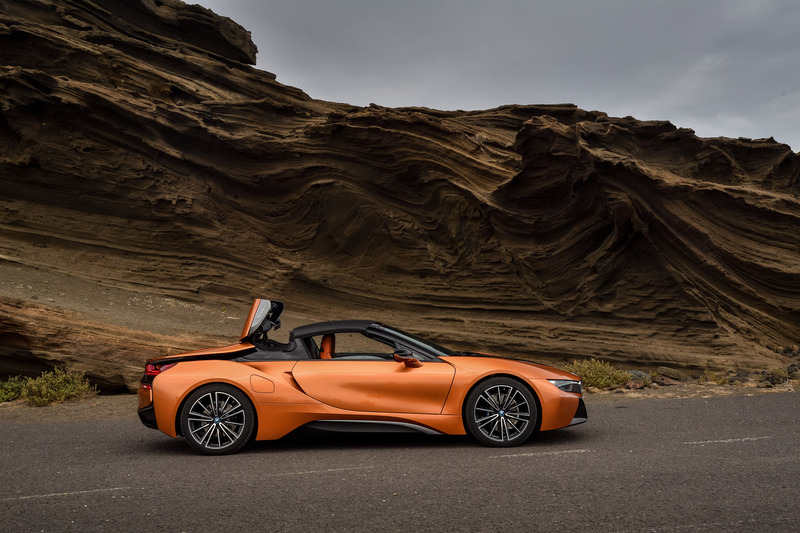 None of the individual stats is enough to wow in this age of 300-mile Teslas and 700-hp Dodges, but when combined as they are in the i8, the effect is just as impressive as any Hellcat or Model S. It’s a brilliant car executed with a level of sophistication and subtlety rarely seen at any price point, and one every owner should be proud to call their own. 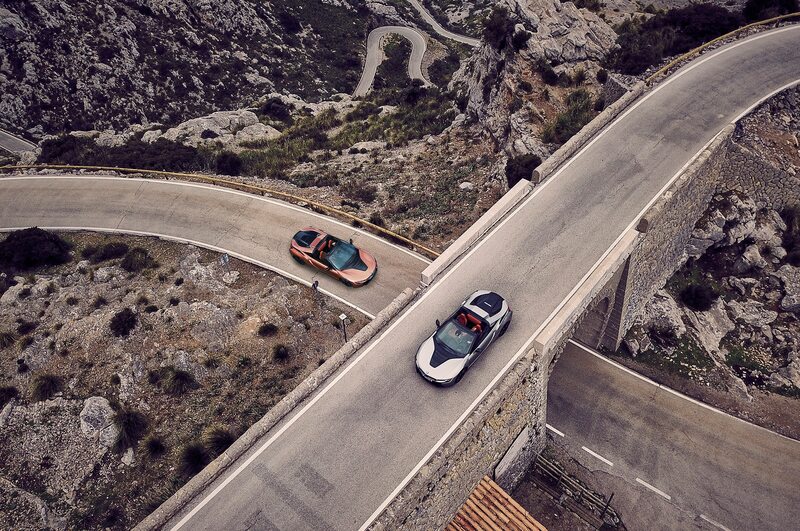 Like the coupe, the roadster is simply in a segment all its own.